We report here that miR-155 and miR-125b play a role in innate immune response. LPS stimulation of mouse Raw 264.7 macrophages resulted in the up-regulation of miR-155 and down-regulation of miR-125b levels. The same changes also occurred when C57BL/6 mice were i.p. injected with LPS. Furthermore, the levels of miR-155 and miR-125b in Raw 264.7 cells displayed oscillatory changes in response to TNF-α. These changes were impaired by pretreating the cells with the proteasome inhibitor MG-132, suggesting that these two microRNAs (miRNAs) may be at least transiently under the direct control of NF-κB transcriptional activity. We show that miR-155 most probably directly targets transcript coding for several proteins involved in LPS signaling such as the Fas-associated death domain protein (FADD), IκB kinase ε (IKKε), and the receptor (TNFR superfamily)-interacting serine-threonine kinase 1 (Ripk1) while enhancing TNF-α translation. In contrast, miR-125b targets the 3′-untranslated region of TNF-α transcripts; therefore, its down-regulation in response to LPS may be required for proper TNF-α production. Finally, Eμ-miR-155 transgenic mice produced higher levels of TNF-α when exposed to LPS and were hypersensitive to LPS/d-galactosamine-induced septic shock. Altogether, our data suggest that the LPS/TNF-α-dependent regulation of miR-155 and miR-125b may be implicated in the response to endotoxin shock, thus offering new targets for drug design. Innate immunity is the first line of defense against pathogens and is triggered by diverse microbial products that are collectively known as pathogen-associated molecular patterns (PAMPs) (1, 2, 3). PAMPs are recognized by evolutionarily conserved “pattern recognition” receptors known as Toll-like receptors or TLRs (1, 2, 3). The best characterized of these is TLR4, which recognizes the Gram-negative product LPS. In B cells and macrophages (3, 4, 5), signals originating by the LPS-triggered TLR4 activate NF-κB (6), and the three classes of MAP kinases (ERK, p38 MAPK, and JNK) (7, 8, 9). Cells responding to LPS produce in return different proinflammatory cytokines, including TNF-α and IL-1, involved in pathogen clearance. Massive stimulation of innate immunity, due to severe Gram-negative bacterial infections, leads to excess production of cytokines and other molecules and the development of a fatal syndrome, known as the septic shock syndrome, which is characterized by fever, hypotension, disseminated intravascular coagulation, and multiple organ failure (10). There are two mouse models for the septic shock syndrome. In the first model, the syndrome is induced by the administration of a large dose of LPS and is characterized by the development of symptoms over a period of several days to a week (11). Mice injected i.v. with anti-IL-1 neutralizing Abs or antagonists of IL-1 become resistant to high dose LPS-induced shock (12), suggesting that IL-1 is the main cytokine responsible for this syndrome. In the second model, the syndrome is induced by the administration of a low dose of LPS combined with the transcriptional inhibitor d-galactosamine (13). This gives rise to a rapidly developing syndrome that culminates in death within 6–10 h. Mice deficient in TNF-α (14) or TNFR1 (15) are resistant to LPS/d-galactosamine-induced shock whereas wild-type mice die within hours after LPS challenge, suggesting that the main cytokine responsible for this syndrome is TNF-α. The induction of TNF-α by LPS is mediated at both transcriptional and posttranscriptional levels (16). Posttranscriptional control of TNF-α expression is achieved by regulating its mRNA stability, polyadenylation, and translational initiation (17, 18, 19). This posttranscriptional regulation depends on AU-rich elements located in the 3′-untranslated region (UTR)6 of TNF-α mRNAs. In resting macrophages, the 3′-UTR of TNF-α mRNA is implicated in the repression of their own translation. However, upon activation the LPS signal relieves the 3′-UTR –dependent posttranscriptional repression, leading to TNF-α production and secretion (7). The inhibition of the ERK1/2, c-JunK, and p38 pathways block the induction of TNF-α by LPS by different mechanisms (7, 8, 9). Tpl2/ERK1/2 seems to control the nucleocytoplasmic transport of TNF-α mRNAs (9), whereas the other pathways seem to control the stability or enhance the translation of TNF-α mRNAs (7, 8). The stabilization or the initiation of translation of TNF-α mRNAs is thought to be controlled by proteins that bind to its 3′-UTR such as tristetraprolin, HuR, TIA-1, and TIAR (20, 21, 22, 23). Since their discovery, microRNAs (miRNAs) have been implicated in a wide array of cellular and developmental processes (24, 25, 26, 27). In particular, they are key players in the regulation of translation or degradation of target mRNAs through base pairing to partially complementary sites (25). Although their number has reached 500 and is still expanding, genetic studies addressing their physiological roles in vivo have just been started. Costinean et al. (28) developed the first transgenic mouse that specifically overexpresses miR-155 in B cells (Eμ-miR-155), thus modeling the human B cell leukemia where the up-regulation of miR-155 is observed. The transgenic mice develop pre-B cell lymphoblastic leukemia followed by B cell malignancy. However the death of these mice is not an early event, suggesting that miR-155 deregulation needs additional genetic alterations for the development of the fully malignant phenotype. Two very recent reports showed that mice deficient for miR-155 are immunodeficient and that this miRNA is required for proper development of T, B, and dendritic cells (29, 30). The fact that miRNAs are implicated in a wide array of cellular processes prompted us to look for miRNAs whose levels would change in innate immune response and investigate their potential functions. We found miR-155 and miR-125b to be up-regulated and down-regulated, respectively, in Raw 264.7 macrophages in response to LPS. Interestingly, upon TNF-α stimulation the levels of these two miRNAs follow an oscillation pattern similar to the oscillatory activity of NF-κB, and both exert positive as well as negative effects in LPS signaling by acting posttranscriptionally to regulate the levels of different proteins involved in this pathway, including TNF-α. MiR-155 overexpression results in enhanced translation of TNF-α, most probably by enhancing the stability of its transcript, and mice overexpressing miR-155 in B cell lineage (Eμ-miR-155) produce more TNF-α when challenged with LPS. The overproduction of this cytokine in response to LPS results in the faster death of Eμ-miR-155 transgenic mice. For the survival experiment, 10-to 12-wk-old Eμ-miR-155 transgenic mice in C57BL/6 background for three generations (28) or their wild-type littermates were inoculated i.p. with 1 mg of d-galactosamine per gram of body weight (Sigma-Aldrich) and 10 μg of LPS (Salmonella enteritidis; Sigma-Aldrich). Eμ-miR-155 mice in C57BL/6 background were chosen to perform the survival experiment as opposed to the Eμ-miR-155 mice in FVB background (28) based on the facts that: 1) Eμ-miR-155 mice in C57BL/6 background do not develop leukemia early in their lives; and 2) based on the miRNA microarray analysis that was used to quantify the miR-155 gene expression, miR-155 level is only seven times higher in Eμ-miR-155 mice than their wild-type littermates. Their only phenotype is a slightly enlarged spleen. For other experiments, mice were sacrificed 1.5 h after the same treatment and total splenocytes were collected and washed twice with PBS. Splenocytes were then resuspended in hypotonic buffer to lyse the RBC. RNAs were then extracted using TRIzol (Invitrogen Life Technologies) according to the manufacturer’s instruction to perform quantitative RT-PCRs and solution hybridization detection assays. Single cell suspensions of splenocytes from Eμ-miR-155 transgenic mice and their wild-type littermates were stimulated with 100 ng/ml LPS and TNF-α production was measured in the culture supernatants using an ELISA kit (BD Biosciences). MCF7, Jurkat, and Raw 264.7 cells were maintained in culture following standard procedures (DMEM supplemented with 10% FBS and penicillin/streptomycin). For the growth factor starvation experiment, cells were grown in medium with 0.5% FBS and stimulated with S. enteritidis-derived LPS (100 ng/ml) or TNF-α (50 ng/ml). The NF-κB inhibitors MG-132 and BAY-117082 were purchased from Calbiochem. Total RNA was extracted with TRIzol reagent (Invitrogen Life Technologies) according to the manufacturer’s instruction. A mirVana solution hybridization detection kit was purchased from Ambion and used following the manufacturer’s instructions. The sequences of the DNA oligonucleotides used to generate complementary RNA probes were as follows: 5′-CCCCTATCACGATTAGCATTAA-3′ for human miR-155, 5′-CCCCTATCACAATTAGCATTAA-3′ for mouse miR-155, and 5′-TCACAAGTTAGGGTCTCTAGGGA-3′ for human as well as mouse miR-125b. A probe specific for U6 snRNA was used as a loading control. Quantitative RT-PCR analyses for miRNAs were performed using TaqMan miRNA assays. In brief, this technique, unlike the conventional assay of random-primed RT, consists of using a target-specific stem-loop structure and a reverse-transcriptase primer followed by a specific real-time assay. All reagents, primers, and probes were obtained from Applied Biosystems. A GAPDH endogenous control was used for normalization. Reverse transcriptase reactions and real-time PCR were performed according to the manufacturer’s protocols. RNA concentrations were determined with a NanoDrop instrument (NanoDrop Technologies). One nanogram of RNA per sample was used for the assays. All RT reactions, including no-template controls and RT minus controls, were run in triplicate in a GeneAmp PCR 9700 Thermocycler (Applied Biosystems). Gene expression levels were quantified using the ABI Prism 7900HT sequence detection system (Applied Biosystems). Relative expression was calculated using the comparative threshold cycle (Ct) method. Raw 264.7 cells were stimulated with 100 ng/ml LPS for 6 h. Total RNA was extracted using TRIzol (Invitrogen Life Technologies) according to the manufacturer’s instruction. miRNA microarray analyses were conducted as previously described (31). The microarray data were submitted to the Minimum Information About a Microarray Experiment (MIAME) database with the accession number E-MEXP-224. The 3′-UTR of genes of interest was inserted into the BamHI-EcoRI cloning sites located 3′ of the GFP encoding sequence of the QBI-GFP25 vector (Autofluorescent Proteins). HEK-293 cells were cotransfected with the indicated miRNAs (100 nM) along with the construct expressing their putative target transcripts as indicated. Pictures were taken 24 h after the transfection using a Zeiss microscope. The sequences of primers used to PCR amplify the fragments of interest from genomic DNA were as follows: TNF-α, 5′-ACTTTGGAGTCATTGCTC-3′ (forward) and 5′-GGAAAGCCCATTTGAGTC-3′ (reverse); Fas-associated death domain protein (FADD), 5′-GAGCTCCTGCGGGAGTAGTTG-3′ (forward) and 5′-CCACAACAGCACCCCCGCCTGA-3′ (reverse); receptor-interacting serine-threonine kinase 1 (Ripk1), 5′-CTTCAGAGTCATCTTGTGCCTTTA-3′ and 5′-CCTTAAAACTCCACTAGAAGCA-3′; and IκB kinase ε (IKKε), 5′-GAGCTCCATGGGGCACATGAGGCA-3′ (forward) and 5′-GGCTGCTGGCCAGGATGTCGCCAG-3′ (reverse). The 3′-UTR of genes of interest containing the putative miRNA target site(s) was cloned into the XbaI site of the pGl3 control vector (Promega). HEK- 293 cells were transfected with 0.8 μg of firefly luciferase reporter vector containing the target site, 100 nM miRNA, and 0.04 μg of Renilla luciferase control vector (pRL-TK-Promega) using Lipofectamine 2000 (Invitrogen Life Technologies). Assays were performed 24 h after transfection using the dual luciferase reporter assay system (Promega). Firefly luciferase activity was normalized to Renilla luciferase activity. The experiments were performed three times in sextuplicates. Statistical differences were determined using Student’s t test. MCF7 cells were transfected on a 6-well plate with either a control oligoribonucleotide or miR-155 (100 nM) using Oligofectamine (Invitrogen Life Technologies). Twenty-four hours later the cells were lysed in SDS sample loading buffer (Bio-Rad). Fifty micrograms of lysates were loaded in SDS-polyacrylamide 4–20% gradient gel (Bio-Rad), transferred to a polyvinylidene difluoride membrane, and blocked in TBS buffer containing 0.1% Tween 20 and 5% milk. An anti-FADD Ab was purchased from Abcam. To identify miRNAs that might be involved in innate immune response, we stimulated mouse Raw 264.7 macrophage cells with 100 ng/ml LPS or PBS vehicle control for 6 h and the extracted RNAs were compared on a miRNA microarray. The results showed that miR-155 was up-regulated ∼2.4 times whereas miR-125b was slightly down-regulated after stimulation. Of note, the mature forms of miR-125b-1 and miR-125b-2, being 100% identical, cannot be distinguished with the probe. Interestingly, miR-125b is predicted to target the 3′-UTR of TNF-α (see below). The up-regulation of miR-155 was confirmed using a liquid hybridization detection assay (Fig. 1⇓A), whereas the down-regulation of miR-125b was confirmed by quantitative RT-PCR (0.75 ± 0.04-fold; data not shown). To determine whether the same kind of changes in miR-155 and miR-125b levels would also happen in vivo, wild-type C57BL/6 mice were i.p. inoculated with 10 μg of S. enteritidis-derived LPS. One hour after treatment, splenocytes were collected and the respective levels of miR-155 and miR-125b in mice injected with LPS (+) and in control mice injected with the PBS vehicle (−) were determined using a liquid hybridization detection assay. Comparative analysis showed that the up-regulation of miR-155 and the down-regulation of miR-125b also occurred in vivo in response to LPS (Fig. 1⇓B). Altogether, these results suggest that these two miRNAs may play a role in LPS signaling. miR-155 is up-regulated while miR-125b is down-regulated in response to LPS. A, RNAs (5μg) extracted from Raw 264.7 cells either treated (+) or not (−) treated with LPS were hybridized to a miR-155 probe and then submitted to RNase digestion. As a control, RNAs were also analyzed with a probe for U6 snRNA. The histogram gives the ratio of densitometric values of miR-155 to U6 snRNA. B, RNAs (5 μg) extracted from splenocytes prepared from C57BL/6 mice i.p. inoculated with either LPS (+) or the PBS vehicle (−) were hybridized either with a miR-125b, a miR-155, or a U6 snRNA probe and further analyzed as in A. Several studies have established TNF-α as a crucial cytokine involved in response to LPS (3, 4, 5). Therefore, we then determined the levels of miR-155 and miR-125b following TNF-α treatment in Raw 264.7 macrophages. Cells were starved of growth factors for 12 h and subsequently stimulated with TNF-α (50 ng/ml) either for 30 min or 1 h. The changes in the levels of miR-155 and miR-125b were then monitored by a liquid hybridization assay. After 30 min of TNF-α stimulation, the level of miR-155 displayed a sharp decrease while the level of miR-125b increased (Fig. 2⇓A, lane 2). A longer treatment, however, led to a quasi-reversal of this situation, with miR-155 and miR-125b approaching and reaching, respectively, their levels before treatment (Fig. 2⇓, lane 4). To determine whether the same kind of change in miR-155 and miR-125b levels following TNF-α treatment could also occur in nonmyeloid cells, we then analyzed RNAs extracted from MCF7 breast carcinoma cells with the same two probes. As shown in Fig. 2⇓B, 30 min of TNF-α treatment did not significantly alter the levels of miR-125b or miR-155. After 1 h, though, the level of miR-125b displayed a sharp increase while the miR-155 still remained the same level (Fig. 2⇓B, lanes 2 and 4). Therefore, the impact of TNF-α treatment on the levels of miR-125b and miR-155 appears to depend on the cell lineage. Indeed, in Jurkat cells TNF-α induced a pattern of change in the level of miR-125b resembling the pattern previously observed in Raw 264.7 cells (an increase after 30 min followed by a decrease after 60 min) as demonstrated by quantitative RT-PCR (data not shown). In contrast, as in MCF7 the level of miR-155 did not significantly change following TNF-α treatment of Jurkat cells (not shown). The oscillation in miR-125b levels (accumulation followed by reduction), observed in both Raw 264.7 and Jurkat cells but not in MCF7 breast carcinoma cells, suggests that the need for the rapid increase in the miR-125b level following TNF-α treatment may be specific to cells of the immune system, most probably to limit the level and duration of the immune response to infections before it becomes detrimental to the health of the organism. Interestingly, this oscillation parallels the rapid increase and subsequent decrease in NF-κB transcriptional activity that primarily results from NF-κB activating the transcription of the gene coding for the inhibitor IκBα (32). In contrast to Raw 264.7 cells, the lack of oscillatory change in miR-125b levels in MCF7 cells most probably resulted from the fact that, in these cells, the activation of the NF-κB pathway by TNF-α is involved in the regulation of cell homeostasis and proliferation but not in response to inflammatory stimuli. The oscillation of the levels of miR-125b and miR-155 following TNF-α stimulation is directly or indirectly controlled by NF-κB activity. A, RNAs extracted from Raw 264.7 cells either pretreated (+) or not pretreated (−) with the NF-κB inhibitor MG-132 (10 μM) were treated (+) or not treated (−) with TNF-α (50 ng/ml) before being analyzed as in Fig. 1⇑B. The histogram gives the respective ratios of miR-125b and miR-155 to U6 snRNA densitometric values. B, RNAs extracted from MCF7 cells either pretreated (+) or not pretreated (−) with the proteasome inhibitor MG-132 (10 μM) were treated (+) or not treated (−) with TNF-α (50 ng/ml) and further analyzed as in Fig. 1⇑B. The above results and the fact that LPS stimulation of macrophages leads to the activation of the canonical NF-κB pathway (6) suggested that the observed changes in the levels of miR-155 and miR-125b may result from the transcriptional activity of NF-κB. To check for this possibility, we then pretreated Raw 264.7 cells with MG-132, a proteasome inhibitor whose presence impairs the TNF-α-induced proteosomal degradation of IκBs, with the result of blocking the nuclear translocation of NF-κB (33). The respective levels of miR-125b and miR-155 following TNF-α treatment were then determined by a liquid hybridization assay. After MG-132 pretreatment, the levels of both miR-125b and miR-155 remained almost unchanged following a 30-min-long TNF-α treatment (Fig. 2⇑A, lane 3), suggesting that the changes previously observed in the absence of MG-132 (Fig. 2⇑A, lane 2) indeed required NF-κB transcriptional activity. Half an hour later, the level of miR-125b was still roughly the same (Fig. 2⇑A, lane 5). In contrast, the miR-155 level displayed a sharp decrease, a change most likely involving other factors either in conjunction with or independently of NF-κB. In MCF7 cells also MG-132 pretreatment resulted in an earlier increase in miR-125b accumulation without significant changes in miR-155 levels (Fig. 2⇑B, lanes 3 and 5). Thus, in both Raw 264.7 and MCF7 cells the expression of miR-125b was clearly dependent on the level of NF-κB activity. We also pretreated Raw 264.7 macrophages with BAY-117082, a compound known to irreversibly inhibit the phosphorylation of IκBα, which is a prerequisite for its proteosomal degradation. In the presence of BAY-117082, the miR-125b level remained low after 30 min of TNF-α treatment but showed a delayed increase after 1 h (data not shown). In contrast, the level of miR-155 was as low after 30 min of TNF-α treatments as it was in the absence of BAY-117082. This result gives a further evidence of a tight link between miR-125b expression and NF-κB activity. In contrast, the relation between NF-κB activity and miR-155 levels remains elusive. Quite a few proteins are known to be involved in LPS signaling downstream of TLR4 (for review, see Refs. 1, 2, 3 , 8 , 9). Among these proteins, FADD and Ripk1 can be mentioned as examples of proteins with dual functions: involvement in immune response signaling while also acting as prosurvival or prodeath factors (34, 35, 36, 37). FADD protein was initially identified as an adaptor molecule required for cell death signaling induced by death domain-containing receptors such as Fas, TNFR1, and TRAILR (37). In addition, it was recently reported that mice deficient for FADD in B cell lineage showed an impaired response to TLR3- and TLR4-induced proliferation (38). Transcripts coding for the above-mentioned proteins and also others known to be involved in LPS signaling were analyzed in silico to determine whether they may represent possible targets for miR-155. PicTar analyses (http://pictar.bio.nyu.edu) showed the IKKε transcripts to be the fourth most probable target of miR-155. IKKε was recently reported to directly phosphorylate the c-Rel subunit of NF-κB, thus promoting its nuclear translocation (39). This prompted us to cotransfect HEK-293 cells with a construct containing the 3′-UTR of IKKε mRNAs fused downstream to the GFP coding sequence along with miR-155. This resulted in a marked reduction of the GFP fluorescence intensity, suggesting that IKKε transcripts may represent actual targets of miR-155 (Fig. 3⇓A). This result was subsequently confirmed using a luciferase assay (Fig. 3⇓B). In addition, the splenocytes of Eμ-miR-155 transgenic mice displayed lower levels of transcripts coding for IKKβ (another kinase involved in NF-κB activation) than their wild-type counterparts, as shown by Affymetrix microarray analysis (28). This result suggests that miR-155 may also possibly control the level of IKKβ, either directly or indirectly. The capability of miR-155 to target transcripts coding for two kinases known to favor the activation of NF-κB, namely IKKε (this report) and IKKβ, down-regulated in Eμ-miR-155 transgenic mice (28), may possibly lead to the repression or at least to the limitation of the activation of the NF-κB pathway, thus opposing or modulating LPS signaling. Computer analyses using RNAhybrid software (http://bibiserv.techfak.uni-bielefeld.de/rnahybrid/) further indicated that transcripts coding for FADD and Ripk1 (36, 37) might also possibly be targeted by miR-155. To check for this possibility, ∼250 bp of the 3′-UTR of the FADD gene and 650 bp of the 3′-UTR of the Ripk1 gene, both these sequences containing the respective putative miR-155 target sequence, were fused downstream of the GFP coding sequence and their sensitivity to miR-155 was assessed by cotransfection with either this miRNA or a control oligoribonucleotide. As shown in Fig. 3⇓A, GFP fluorescence was markedly reduced in cells transfected with miR-155-FADD-target sequence, a result subsequently confirmed by luciferase assay (Fig. 3⇓B) and Western blotting (Fig. 3⇓C). Based on the luciferase assay, miR-155 was also seemingly able to target Ripk1 transcripts, although not as efficiently as IKKε and FADD mRNAs (Fig. 3⇓, A and B). Altogether, these results suggest that transcripts coding for at least two other proteins involved in LPS/TNF-α signaling, FADD and most probably also Ripk1, may be directly targeted by miR-155. Identification of IKKε, FADD, and Ripk1 transcripts as potential targets of miR-155. A, HEK-293 cells were cotransfected with a construct containing the 3′-UTR of the indicated genes fused downstream to the GFP-encoding sequence and either miR-155 or a control oligoribonucleotide. Pictures were taken 24 h after transfection. B, Dual luciferase assay of HEK-293 cells cotransfected with a firefly luciferase construct containing the 3′-UTR of the indicated genes and either miR-155 or a control oligoribonucleotide. Values represent mean ± SD. C, Western blotting of MCF7 cells transfected with miR-155. 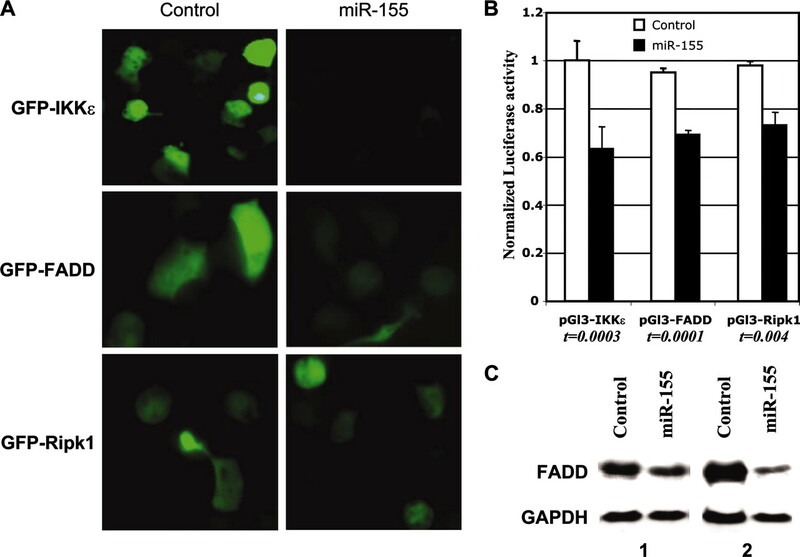 Overexpression of miR-155 results in the down-regulation of the levels of FADD protein. The numbers 1 and 2 denote the results of the experiment done twice. The 3′-UTR of TNF-α mRNAs is implicated in the repression of their own translation (7). LPS/TNF-α inducing signals target the 3′-UTR of TNF-α and relieve this self-inhibitory effect. Computer analysis using the miRNA targets software MIRANDA (http://www.microrna.org/) predicted that miR-125a and miR-125b might possibly target the 3′-UTR of both mouse and human TNF-α transcripts, suggesting that these two miRNAs could play a role in their posttranscriptional regulation. As miR-125b was shown to be down-regulated in response to LPS in Raw 264.7 cells as well as in mouse splenocytes, we hypothesized that miR-125b may target TNF-α transcripts. To get some clue about this possibility, we inserted the 300 first upstream bp of the 3′-UTR of the mouse TNF-α gene, which contains the putative miR-125b interactor site, into the pGl3 luciferase vector downstream of the luciferase coding sequence. The cotransfection of HEK-293 cells with this pGl3–3′-UTR-TNF-α construct, along with miR-125b, resulted in a decrease of the luciferase activity (∼20% of 18 replicate experiments) as compared with the cotransfection with a control oligoribonucleotide (Fig. 4⇓A). By contrast, the cotransfection of the same construct with miR-155 did not result in a measurable change in luciferase activity (data not shown). This result gives a good indication that miR-125b may be implicated in the posttranscriptional repression of TNF-α mRNAs, hence the need for its down-regulation for proper TNF-α production. 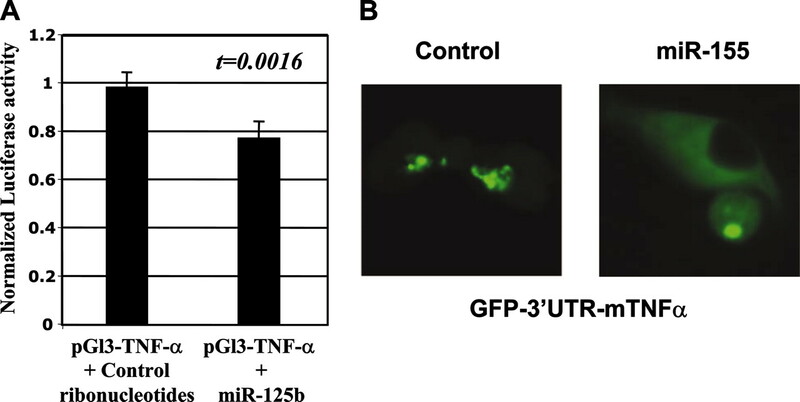 miR-125b and miR-155 have opposite effects on the 3′-UTR of TNF-α. A, miR-125b targets the 3′-UTR of TNF-α. Dual luciferase assay of HEK-293 cells cotransfected with a firefly luciferase construct containing the 3′-UTR of mouse TNF-α and miR-125b or a control oligoribonucleotide. Values represent means ± SD. B, miR-155 might possibly enhance TNF-α translation by acting at its 3′-UTR. HEK-293 cells were cotransfected with a construct containing the 3′-UTR of TNF-α fused downstream to the GFP-encoding sequence and either miR-155 or a control oligoribonucleotide. Pictures were taken 24 h after transfection. Based on the facts that: 1) TNF-α is the main cytokine produced by macrophages in response to LPS (1, 2, 3, 4), 2) TNF-α transcripts are expressed but not translated in unstimulated Raw 264.7 cells (19); 3) this translational repression requires the presence of the 3′-UTR of TNF-α mRNAs (7); and 4) miR-155 was up-regulated in Raw 264.7 cells in response to LPS (Fig. 1⇑, this report); we hypothesized that the up-regulation of the miR-155 level in response to LPS may play a role in the regulation of TNF-α production. To check for any possible kind of effect of miR-155 upon TNF-α production, we then cotransfected HEK-293 cells with a GFP-3′-UTR-TNF-α construct containing the first 250 bp of the 3′-UTR of TNF-α mRNAs fused 3′ of the GFP coding sequence along with miR-155. Of note, this experiment was not conducted in Raw 264.7 macrophages, for it is not possible to transfect them efficiently in a transient manner or to derive stably transfected lines. To our surprise, not only was the overall amount of GFP produced in cells transfected with miR-155 higher than that produced in cells transfected with a control oligoribonucleotide, but its cytoplasmic distribution was also strikingly different. Namely, in the presence of miR-155 the GFP was much less concentrated in small particles but more regularly spread across the whole cytoplasm (Fig. 4⇑B). Although this result will require further analysis, it suggests that up-regulation of the miR-155 level in response to LPS may be needed to release the self-inhibitory effects of the 3′-UTR of TNF-α mRNAs upon their own transcription through a mechanism that remains to be characterized. The fact that miR-155 was up-regulated in response to LPS, along with the above results (Fig. 4⇑B), leads us to hypothesize that Eμ-miR-155 transgenic mice, whose B cells overexpress the miR-155 gene (28), should produce more TNF-α than wild-type mice in response to endotoxin shock. This was tested by challenging Eμ-miR-155 transgenic mice and their wild-type littermates with LPS. Indeed, an ELISA showed that the sera of transgenic mice actually contained higher levels of TNF-α than the sera of their control wild-type littermates (Fig. 5⇓A). This higher secretion of TNF-α in response to LPS should then expectedly make the Eμ-miR-155 mice more sensitive to LPS/d-galactosamine-induced endotoxin shock. To check for this logical output, five Eμ-miR-155-C57BL/6 transgenic mice and five wild-type littermate controls were injected with d-galactosamine (1 mg per gram of body weight) plus 10 μg of S. enteritidis-derived LPS. This dose of d-galactosamine was previously reported to sensitize the animals to the cytotoxic effects of TNF-α and lead them to a rapid death (6–10 h) after LPS treatment (13). We indeed found that the transgenic mice died in average 1.5 h earlier than the wild-type ones (6.5 vs 8.20 h) (Fig. 5⇓B). Collectively, these data establish the up-regulated levels of miR-155 in response to LPS as an indicator of an increased sensibility to endotoxin shock. Eμ-miR-155 transgenic mice produce more TNF-α in response to LPS and are more sensitive to LPS/d-galactosamine-induced endotoxin shock. A, Eμ-miR-155 transgenic mice (n = 5) and wild-type littermate controls (n = 5) were i.p. injected with d-galactosamine (1 mg per gram of body weight) and with 10 μg of LPS. One hour and a half later their sera were collected and TNF-α levels were determined using the BD OptEIA ELISA kit in triplicate for each sample. Data represent mean values ± SD. B, Eμ-miR-155 transgenic mice are more sensitive to LPS/d-galactosamine-induced endotoxin shock. Eight- to 10-wk-old Eμ-miR-155 transgenic mice (n = 5) and five wild-type littermate controls were injected i.p. with d-galactosamine (1 mg per gram of body weight) and 10 μg of LPS. Their recorded survival times are given in hours. This study was aimed to identify miRNAs that might be possibly involved in the innate immune response and assess their potential functions. Our results establish that miR-155 and miR-125b are up-regulated and down-regulated, respectively, in Raw 264.7 cells in response to LPS. The same changes were observed when C57BL/6 mice were challenged with LPS and the expression levels of these two miRNAs were analyzed before and after LPS injection. Two reports from Dr. Baltimore’s group (40, 41) showed the up-regulation of the miR-155 level in response to LPS and to virally relevant stimuli in human monocytes, whereas two recent reports (29, 30) showed an impaired response of B cells from miR-155−/− knockout mice toward LPS. 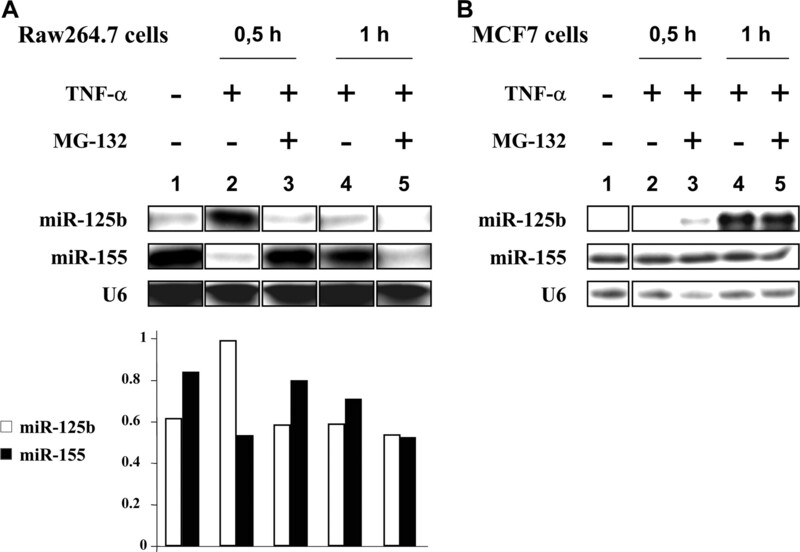 The above reports together with the results from this report (up-regulation of miR-155 expression in Raw 264.7 cells and in wild-type C57BL/6 mice when stimulated with LPS and its oscillatory changes upon TNF-α stimulation) give strong indication that miRNA-155 likely plays a central role in the regulation of the response to a large panel of bacterial and viral infection in both mouse and human, thus making it a very good candidate target for drug discovery. In addition, although miR-125b levels in Raw 264.7 cells stimulated with LPS seemed to be only slightly lower than those in unstimulated control cells, the significant down-regulation of miR-125b in LPS-injected C57BL/6 wild-type mice, strongly suggests that it might also play a role in LPS signaling. TNF-α is one of the main cytokines involved in the response to LPS, and our results showed that miR-155 and miR-125b have opposite effects on TNF-α production, in agreement with the fact that they are up-regulated and down-regulated, respectively, in response to LPS. MiR-125b was shown to be able to target TNF-α transcripts at their 3′-UTR, suggesting that relative high levels of miR-125b in the absence of LPS may be needed in macrophages to help to ensure that the LPS pathway remains turned off in the absence of microbial infection. This hypothesis is further supported by the fact that the overexpression of miR-125b leads to a significant reduction of ERK1/2 activation without changing ERK1/2 protein levels, consistent with the idea that this miRNA acts upstream of ERK1/2 (42). Taking into account that LPS stimulation also results in the activation of the Tpl2/ERK1/2 pathway, which is needed to permit the transport of nuclear TNF-α mRNAs toward the cytoplasm and thus allow their translation (9), the physiological signification of down-regulating miR-125b levels upon LPS challenge thus likely arises from its resulting in the Tpl2/ERK1/2 pathway activation and an increase in the production and secretion of TNF-α. Interestingly, miR-125b has been reported to be able to accelerate the deadenylation of target transcripts (43), and the stability of TNF-α mRNA transcripts is also regulated by polyadenylation. Therefore, miRNA-125b may use different mechanisms to down-regulate posttranscriptionally the expression of TNF-α, i.e., repression of translation by targeting its 3′-UTR, rapid deadenylation of TNF-α transcripts, or both. Our results suggest that miR-155 also may act directly or indirectly to increase the rate of translation of TNF-α transcripts (Fig. 4⇑B), possibly through their redistribution across the cytoplasm and/or enhancement of TNF-α transcript stability. In accordance with this result, Eμ-miR-155 transgenic mice produced more TNF-α when challenged with LPS. Furthermore, the miR-15−/− B cells produce less TNF-α when challenged with LPS (29, 30). The authors showed that miR-155 effects on TNF-α production are at the transcriptional level (30). Thus, more TNF-α transcripts were observed in wild-type mice compared with miR-155−/− mice. Considering the results of our report and the results from Thai et al., (30) we propose that miR-155 enhances the stability of the TNF-α transcript. This effect is through the 3′-UTR of TNF-α transcripts (Fig. 4⇑B), in agreement with the fact that mice carrying a targeted deletion of TNF-α AU-rich elements (7) show elevated levels of TNF-α in response to LPS. Another possible explanation could be that miR-155 may enhance the translation of TNF-α transcripts by targeting proteins that bind to its 3′-UTR. As a matter of fact, knockout mice for TIA-1 or tristetraprolin show elevated levels of TNF-α production in response to LPS. The fact that miR-155 targets transcripts encoding proteins, such as IKKε, FADD and Ripk1 (Fig. 3⇑B) whose ultimate function results in the activation of the LPS/TNF-α pathway, while it increases TNF-α production suggests that this miRNA may exert both positive and negative effects on LPS signaling. This hypothesis is further supported by the results of an Affymetrix DNA array analysis of Eμ-miR-155 transgenic mice gene expression (28). Namely, in these mice miR-155 overexpression resulted in the up-regulation of the IL-1 receptor-like 1 and TNF-α induced protein 2 genes but also in the down-regulation of the genes coding for both MAPK11 (p38 β) and TNF receptor super family member 25 (TNFRSF25). Noteworthily, these proteins have been previously reported to play a positive role in LPS signaling (44, 45). Nevertheless, Eμ-miR-155 transgenic mice happened to be significantly more sensitive to LPS-induced endotoxin shock than their wild-type littermates. This indicates that the up-regulation of TNF-α production in these transgenic animals is sufficient to override the negative regulatory effects of miR-155 onto LPS/TNF-α signaling. Still another nonexclusive possibility would be that the effects of miR-155 onto the LPS pathway are timed. At first miR-155 would favor the up-regulation of TNF-α production and therefore have positive effects onto the activation of the LPS pathway. A second time, the delayed targeting of transcripts encoding proteins like FADD, IKKε, and/or Ripk1 would limit the altitude and/or the duration of the activation of this miRNA in the same pathway. Several reports have established miR-155 as an oncogene (28, 46, 47). Although FADD protein is very well known for its proapoptotic role, it was also reported that FADD-deficient B cells showed impaired proliferation response when challenged with LPS (38). Interestingly, both FADD and the Ripk1 contain death domains. These two proteins are recruited in proximity to TNFR1 upon its activation and, together with other proteins, trigger downstream signals leading to apoptosis, necrosis, or NF-κB activation and induction of target genes mediating inflammation depending on the cell context. TNFR1 occupancy can initiate FADD/caspase-8 dependent apoptosis or a Ripk1-dependent nonapoptotic death program that results in necrosis (35). It is thus reasonable to assume that miR-155 targeting of transcripts coding for these two proteins may allow for the LPS/TNF-α signaling pathway to antagonize death by apoptosis or necrosis. These antiapoptotic effects through the targeting of FADD and/or Ripk1 transcripts are probably one of the reasons why miR-155 overexpression can lead to oncogenesis. It will thus be of primary interest to determine whether miR-155 can also target other death domain-containing proteins. In addition, the oncogenic potential of miR-155 may also arise from its capability to release the translational inhibition of transcript encoding factors that may favor cell proliferation or survival, such as TNF-α or other cytokines. Splenocytes of Eμ-miR-155 transgenic mice displayed lower levels of transcripts coding for IKKβ (another kinase involved in NF-κB activation) than their wild-type counterparts as shown by Affymetrix microarray analysis (28). This capability of miR-155 to control both IKKβ and IKKε transcripts could possibly lead to the repression or at least the limitation of the activation of the NF-κB pathway, thus opposing or modulating LPS signaling. Of note, IκBα is responsible for a strong negative feedback, allowing for temporal control of NF-κB activity with qualitative effects on target gene regulation (48). Furthermore, IKK activation is also under temporal regulation. Thus, while TNF-α-induced IKK activity is rapidly attenuated by negative feedback, LPS signaling leads to a slower but more sustained activation of IKKs, resulting in a progressive increase in NF-κB nuclear activity with transcriptional outputs specific for each of these inflammatory stimuli (43, 48, 49). In particular, IKKα can limit the amplitude and duration of pathogen-induced NF-κB activation by dampening the induction of proinflammatory and antiapoptotic genes in LPS-exposed macrophages. It is thus conceivable that genes like miR-155 and miR-125b may be controlled and act in the same manner. The failure of cytokine neutralization strategies to protect septic patients from death has heightened the interest in the study of the LPS-induced signal transduction pathway in target cells. TNF-α is a major mediator of endotoxin shock that also plays a role in several pathologies. Therefore, improving our understanding of its synthesis, secretion, and mode of action should ultimately lead to the development of drugs better suited to particular diseases, as well as to the design of new therapeutic approaches. We believe that our report about the opposite effects of miR-125b and miR-155 in TNF-α production, the observed oscillatory changes in the levels of miR-155 and miR-125b, and their possible roles in modulating TNF-α and LPS signaling by targeting different components of these pathways may contribute to drug improvements in the near future. ↵1 This work was supported by Program Project Grants P01CA76259 and P01CA81534 from the National Cancer Institute (to C.M.C. ), a Kimmel Scholar award, and a Chronic Lymphocytic Leukemia Research Foundation Grant (to G.A.C.). ↵2 E.T. and J.-J.M. contributed equally to this work. ↵3 Current address: 3M Center, Saint Paul, MN 55144. ↵4 Current address: Department of Experimental Therapeutics and Department of Cancer Genetics, University of Texas, Monroe Dunaway Anderson Cancer Center, Houston, TX 77030. ↵6 Abbreviations used in this paper: UTR, untranslated region; FADD, Fas-associated death domain protein; IKKε, IκB kinase ε; miRNA, microRNA; Ripk1, receptor (TNFR superfamily)-interacting serine-threonine kinase 1; snRNA, small nuclear RNA. Janeway, C. A., R. Medzhitov. 2002. Innate immune recognition. Annu. Rev. Immunol. 20: 197-216. Anderson, K. V.. 2000. Toll signaling pathways in the innate immune response. Curr. Opin. Immunol. 12: 13-19. Schletter, J., H. Heine, A. J. Ulmer, E. T. Rietschel. 1995. Molecular mechanisms of endotoxin activity. Arch. Microbiol. 164: 383-389. Sha, W. C., H. C. Liou, E. I. Tuomanen, D. Baltimore. 1995. Targeted disruption of the p50 subunit of NF-κB leads to multifocal defects in immune responses. Cell 80: 321-330. Kontoyiannis, D., M. Pasparakis, T. T. Pizarro, F. Cominelli, G. Kollias. 1999. Impaired on/off regulation of TNF biosynthesis in mice lacking TNF AU-rich elements: implications for joint and gut-associated immunopathologies. Immunity 10: 387-398. Kotlyarov, A., A. Neininger, C. Schubert, R. Eckert, C. Birchmeier, H. D. Volk, M. Gaestel. 1999. MAPKAP kinase 2 is essential for LPS-induced TNF-α biosynthesis. Nat. Cell. Biol. 1: 94-97. Dumitru, C. D., J. D. Ceci, C. Tsatsanis, D. Kontoyiannis, K. Stamatakis, J. H. Lin, C. Patriotis, N. A. Jenkins, N. G. Copeland, G. Kollias, P. N. Tsichlis. 2000. TNF-α induction by LPS is regulated posttranscriptionally via a Tpl2/ERK-dependent pathway. Cell 103: 1071-1083. Parillo, J. E.. 1993. Pathogenic mechanisms of septic shock. N. Engl. J. Med. 328: 1471-1477. Fink, M. P., S. O. Heard. 1990. Laboratory models of sepsis and septic shock. J. Surg. Res. 49: 186-196. Dinarello, C. A., J. A. Gelfand, S. M. Wolff. 1993. Anticytokine strategies in the treatment of the systemic inflammatory response syndrome. J. Am. Med. Assoc. 269: 1829-1835. Galanos, C., M. A. Freudenberg, W. Reutter. 1979. Galactosamine-induced sensitization to the lethal effects of endotoxin. Proc. Natl. Acad. Sci. USA 76: 5939-5943. Pasparakis, M., L. Alexopoulou, V. Episkopou, G. Kollias. 1996. Immune and inflammatory responses in TNF α-deficient mice: a critical requirement for TNF α in the formation of primary B cell follicles, follicular dendritic cell networks and germinal centers, and in the maturation of the humoral immune response. J. Exp. Med. 184: 1397-1411. Raabe, T., M. Bukrinsky, R. A. Currie. 1998. Relative contribution of transcription and translation to the induction of tumor necrosis factor-α by lipopolysaccharide. J. Biol. Chem. 273: 974-980. Han, J., B. Beutler. 1990. The essential role of the UA-rich sequence in endotoxin-induced cachectin/TNF synthesis. Eur. Cytokine Network 1: 71-75. Han, J., T. Brown, B. Beutler. 1990. Endotoxin-responsive sequences control cachectin/tumor necrosis factor biosynthesis at the translational level. J. Exp. Med. 171: 465-475. Wang, E., W. J. Ma, C. Aghajanian, D. R. Spriggs. 1997. Posttranscriptional regulation of protein expression in human epithelial carcinoma cells by adenine-uridine-rich elements in the 3′-untranslated region of tumor necrosis factor-α messenger RNA. Cancer Res. 57: 5426-5433. Taylor, G. A., E. Carballo, D. M. Lee, W. S. Lai, M. J. Thompson, D. D. Patel, D. I. Schenkman, G. S. Gilkeson, H. E. Broxmeyer, B. F. Haynes, P. J. Blackshear. 1996. A pathogenetic role for TNF α in the syndrome of cachexia, arthritis, and autoimmunity resulting from tristetraprolin (TTP) deficiency. Immunity 4: 445-454. Dean, J. L., R. Wait, K. R. Mahtani, G. Sully, A. R. Clark, J. Saklatvala. 2001. The 3′ untranslated region of tumor necrosis factor α mRNA is a target of the mRNA-stabilizing factor HuR. Mol. Cell. Biol. 21: 721-730. Piecyk, M., S. Wax, A. R. Beck, N. Kedersha, M. Gupta, B. Maritim, S. Chen, C. Gueydan, V. Kruys, M. Streuli, P. Anderson. 2000. TIA-1 is a translational silencer that selectively regulates the expression of TNF-α. EMBO J. 19: 4154-4163. Gueydan, C., L. Droogmans, P. Chalon, G. Huez, D. Caput, V. Kruys. 1999. Identification of TIAR as a protein binding to the translational regulatory AU-rich element of tumor necrosis factor α mRNA. J. Biol. Chem. 274: 2322-2326. Ambros, V.. 2004. The functions of animal miRNAs. Nature 431: 350-355. Bartel, D. P.. 2004. MiRNAs: genomics, biogenesis, mechanism, and function. Cell 116: 281-297. Calin, G. A., C. M. Croce. 2006. MiRNA signatures in human cancers. Nat. Rev. Cancer 6: 857-866. He, L., G. J. Hannon. 2004. MiRNAs: small RNAs with a big role in gene regulation. Nat. Rev. Genet. 5: 522-531. Costinean, S., N. Zanesi, Y. Pekarsky, E. Tili, S. Volinia, N. Heerema, C. M. Croce. 2006. PreB cell proliferation and lymphoblastic leukemia/high-grade lymphoma in Eμ-miR155 transgenic mice. Proc. Natl. Acad. Sci. USA 103: 7024-7029. Rodriguez, A., E. Vigorito, S. Clare, M. V. Warren, P. Couttet, D. R. Soond, S. van Dongen, R. J. Grocock, P. P. Das, E. A. Miska, et al 2007. Requirement of bic/microRNA-155 for normal immune function. Science 316: 608-611. Thai, T. H., D. P. Calado, S. Casola, K. M. Ansel, C. Xiao, Y. Xue, A. Murphy, D. Frendewey, D. Valenzuela, J. L. Kutok, et al 2007. Regulation of the germinal center response by microRNA-155. Science 316: 604-608. Liu, C. G., G. A. Calin, B. Meloon, N. Gamliel, C. Sevignani, M. Ferracin, C. D. Dumitru, M. Shimizu, S. Zupo, M. Dono, et al 2004. An oligonucleotide microchip for genome-wide miRNA profiling in human and mouse tissues. Proc. Natl. Acad. Sci. USA 101: 9740-9744. Hoffmann, A., A. Levchenko, M. L. Scott, D. Baltimore. 2002. The IκB-NF-κB signaling module: temporal control and selective gene activation. Science 298: 1241-1245. Wang, X. C., C. Jobin, J. B. Allen, W. L. Roberts, G. J. Jaffe. 1999. Suppression of NF-κB-dependent proinflammatory gene expression in human RPE cells by a proteasome inhibitor. Invest. Ophthalmol. Visual Sci. 40: 477-486. Hsu, H., J. Huang, H. B. Shu, V. Baichwal, D. V. Goeddel. 1996. TNF-dependent recruitment of the protein kinase RIP to the TNF receptor-1 signaling complex. Immunity 4: 387-396. O’Donnell, M. A., D. Legarda-Addison, P. Skountzos, W. C. Yeh, A. T. Ting. 2007. Ubiquitination of RIP1 regulates an NF-κB-independent cell-death switch in TNF signaling. Curr. Biol. 17: 418-424. Ting, A. T., F. X. Pimentel-Muinos, B. Seed. 1996. RIP mediates tumor necrosis factor receptor 1 activation of NF-κB but not Fas/APO-1-initiated apoptosis. EMBO J. 15: 6189-6196. Zhang, Y., S. Rosenberg, H. Wang, H. Z. Imtiyaz, Y. J. Hou, J. Zhang. 2005. Conditional Fas-associated death domain protein (FADD): GFP knockout mice reveal FADD is dispensable in thymic development but essential in peripheral T cell homeostasis. J. Immunol. 175: 3033-3044. Imtiyaz, H. Z., S. Rosenberg, Y. Zhang, Z. S. Rahman, Y. J. Hou, T. Manser, J. Zhang. 2006. The Fas-associated death domain protein is required in apoptosis and TLR-induced proliferative responses in B cells. J. Immunol. 176: 6852-6861. Harris, J., S. Oliere, S. Sharma, Q. Sun, R. Lin, J. Hiscott, N. Grandvaux. 2006. Nuclear accumulation of cRel following C-terminal phosphorylation by TBK1/IKKε. J. Immunol. 177: 2527-2535. Taganov, K. D., M. P. Boldin, K. J. Chang, D. Baltimore. 2006. NF-κB-dependent induction of miRNA miR-146, an inhibitor targeted to signaling proteins of innate immune responses. Proc. Natl. Acad. Sci. USA 103: 12481-12486. O’Connell, R. M., K. D. Taganov, M. P. Boldin, G. Cheng, D. Baltimore. 2007. MicroRNA-155 is induced during the macrophage inflammatory response. Proc. Natl. Acad. Sci. USA 104: 1604-1609. Scott, G. K., A. Goga, D. Bhaumik, C. E. Berger, C. S. Sullivan, C. C. Benz. 2007. 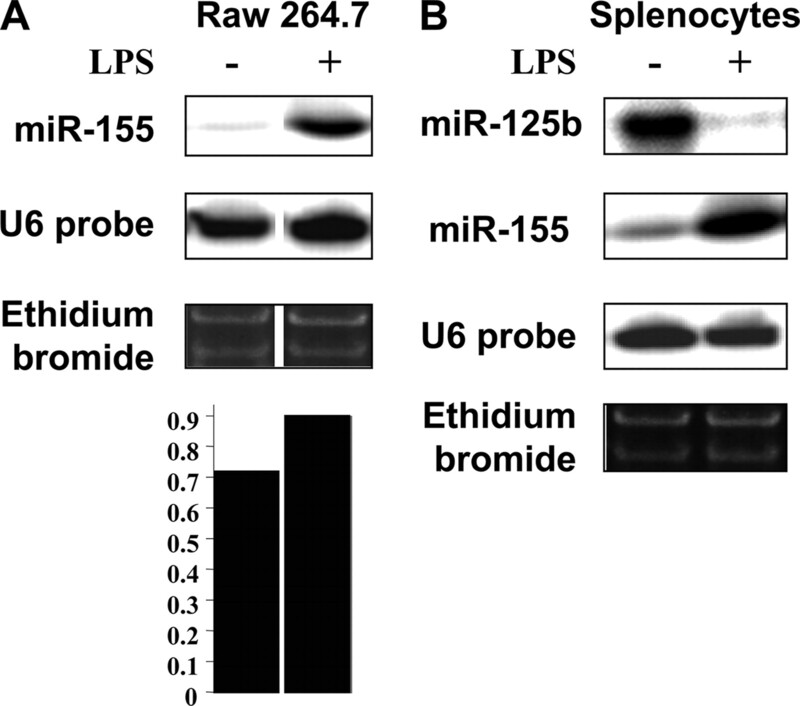 Coordinate suppression of ERBB2 and ERBB3 by enforced expression of miRNA miR-125a or miR-125b. J. Biol. Chem. 282: 1479-1486. Wu, L., J. Fan, J. G. Belasco. 2006. MicroRNAs direct rapid deadenylation of mRNA. Proc. Natl. Acad. Sci. USA 103: 4034-4039. Mahlknecht, U., J. Will, A. Varin, D. Hoelzer, G. Herbein. 2004. Histone deacetylase 3, a class I histone deacetylase, suppresses MAPK11-mediated activating transcription factor-2 activation and represses TNF gene expression. J. Immunol. 173: 3979-3990. Chaudhary, P. M., M. Eby, A. Jasmin, A. Bookwalter, J. Murray, L. Hood. 1997. Death receptor 5, a new member of the TNFR family, and DR4 induce FADD-dependent apoptosis and activate the NF-κB pathway. Immunity 7: 821-830. Volinia, S., G. A. Calinx, C. G. Liu, S. Ambs, A. Cimmino, F. Petrocca, R. Visone, M. Iorio, C. Roldo, M. Ferracin, et al 2006. A microRNA expression signature of human solid tumors defines cancer gene targets. Proc. Natl. Acad. Sci. USA 103: 2257-2261. Eis, P. S., W. Tam, L. Sun, A. Chadburn, Z. Li, M. F. Gomez, E. Lund, J. E. Dahlberg. 2005. Accumulation of miR-155 and BIC RNA in human B cell lymphomas. Proc. Natl. Acad. Sci. USA 102: 3627-3632. Werner, S. L., D. Barken, A. Hoffmann. 2005. Stimulus specificity of gene expression programs determined by temporal control of IKK activity. Science 309: 1857-1861. Scheidereit, C.. 2006. IκB kinase complexes: gateways to NF-κB activation and transcription. Oncogene 25: 6685-6705.